Andrew F. Ryan, a 6th-generation of the Ryan Ranch in Bodega, has returned home to his roots after a brief stint away for school, work and travel. 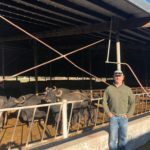 After earning a Bachelor’s degree from CSU-Chico, Andrew spent his time working in a myriad of positions for Aidells Sausage, Gallo Salame, Tyson Foods and Ammunition Wine Co. He currently works on the ranch and McCall Real Estate Team at Keller Williams. He enjoys the outdoors, good music, rib-eye steaks and his fresh tomatoes in the summer. As the new chairman of the YFR, he’s looking forward to working with the new YF&R officers and amplifying the voice of Sonoma-Marin agriculture. Tristan Benson spends his time working on the family ranch producing plums, Asian pears and grain. Benson hopes that someday he can hold a seat on the Board of Directors in addition to increasing his involvement in grain industry organizations. Lori Bisordi is a fifth generation family farmer in Sonoma County. Her family has been farming grapes in Fulton since 1898. She attended Santa Rosa Junior College and received her Associate’s degree in Viticulture. She currently works on the family ranch and will be attending school in the fall. As secretary, she is looking forward to a wonderful and exciting year ahead. It is a great honor to be able to represent the future of agriculture and she hopes she represents the Sonoma-Marin YF&R well! Taylor Serres is a fifth generation rancher in Sonoma. Her family is in wine grapes, blueberries, commercial beef cattle and construction. Taylor has recently started to work for her family’s business with the plan of starting a winery and expanding the current operations. After earning a Bachelor’s degree in Enology from Cal Poly San Luis Obispo and working for a couple of different companies in Sonoma, Taylor has decided it is time to come back to the family; one of her long time goals. As an experienced leader in Young Farmers & Ranchers, Taylor was elected the Treasurer and is eager to work with the new team to get some fresh minds and ideas to help the group prosper and become sustainable in Sonoma County. Michelle McClure is the fifth generation to be involved with her family’s dairy farm in the Point Reyes National Seashore. She graduated from Cal Poly, San Luis Obispo with a Bachelor’s degree in Agricultural Communication. Upon graduation, she returned to Sonoma County where she works in the appraisal department at American AgCredit. Michelle is excited to work with the YF&R committee and hopes to increase its involvement in the community. Lindsey Strain graduated from Cal Poly, San Luis Obispo with a bachelor’s degree in Agribusiness. She is currently managing her family’s business, Bodega Bay Oyster Company. Julian Clymer is very excited to join the officers of YF&R and has recently relocated to the North Coast as a vineyard representative for Sunridge Grapevine Nursery. His career began at Pacific Vineyard Company while studying engineering at Cal Poly SLO; then expanded his knowledge of enology and viticulture at Allan Hancock College in Santa Maria. He has filled roles in pest & disease management, sustainable farming, and cellar production teams across Argentina, Australia, and California. While originally from Washington State, he has felt welcomed by the wonderful community here in Sonoma County and is looking forward to building a new home. Matt Stornetta is a fifth generation Sonoma farmer. Matt works at La Prenda Vineyards Management in Sonoma as Operations Manager. Matt works daily to implement more efficient vineyard cultural practices including various levels of mechanization. Matt graduated from Cal Poly and traveled to Casablanca, Chile where he worked for five months at the Veramonte Winery. As an experienced YF&R member Matt is ecstatic at the level of involvement by youth in the Sonoma Marin agricultural community. William Pacheco is your basic good old boy from Sonoma County. He was born and raised in West Petaluma and continues in the family business. He is a fourth generation dairy farmer. 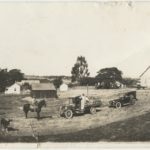 William’s family currently owns and operates 230 acres were they milk cows and goats to produce their own dairy products. The products are distributed local farmer’s markets throughout the Bay Area. William’s job requires him to raise and milk 80 head of Jerseys and he manages part of the feed supply by hauling brewer’s malt from local breweries. He is very excited to be representing the YF&R and is looking forward to the new connections and opportunities that will be presented. If you have questions or would like to join YF&R, please email sonomamarinyfr@gmail.com.